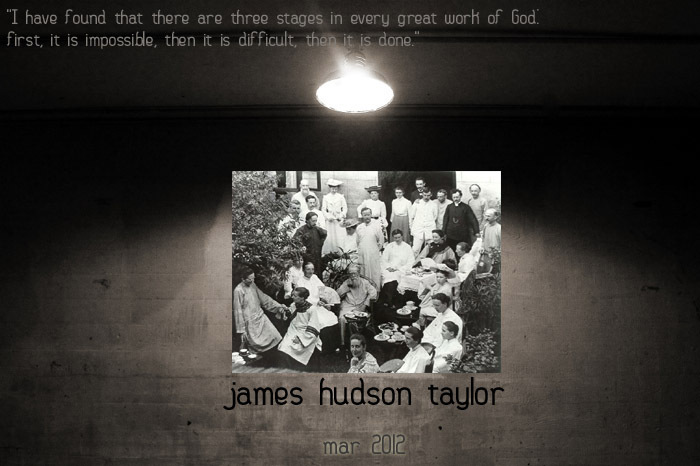 James Hudson Taylor was born May 21, 1832 in Barnsley, England to James and Amelia Taylor, both devout Christians who raised their son in the Christian faith. In his memoir, In Retrospect, Taylor recalled his parents’ efforts and his resistance to the message. For a time, he volunteered as a medical assistant with Dr. Robert Hardy in a poor neighborhood of Kingston where he also preached the Gospel and passed out tracts. A year later, he began studying medicine at the Royal London Hospital in Whitechapel. The ship landed in Shanghai on March 1, 1854. After renting a house, he took to sleeping during the day so he would remain alert at night when the fighting was more intense. Eventually, he realized he would have to return to the Foreign Settlement, and not a minute too soon. Before all of his belongings had been removed, the house was burned to the ground. In was in this climate of terror that Taylor began to evangelize. The two missionaries were dragged through the “long weary streets. . . I thought they would never end, and seldom have I felt more thankful than when we stopped at a place where we were told a mandarin resided.” They eventually found themselves in the presence of a mandarin “who seemed to be the highest authority of T’ung-chau” who listened respectfully as they explained the purpose of their mission, then let them distribute Gospel tracts in the city. Taylor made 18 preaching tours of China and, in 1865, founded the Chinese Inland Mission which survives today as Overseas Missionary Fellowship. It proved an innovative ministry with missionaries drawn from various Christian denominations overseen, not by committees in the home country, but by leaders who were serving alongside them in the field. The missionaries would also adopt the dress of the Chinese to increase their identification with the people they served. For much of his life, Taylor struggled with ill health, and he was frequently visited by tragedy. In July 1870, he would lose a son only weeks after birth, then lose Maria three days later. A daughter died of water on the brain, and his second wife, Jane, whom he married in 1871, would succumb to cancer. In bringing the Gospel to China, his life was often on the line, but he never wavered in his faith or his belief that it was God who provided the muscle with which men wrestled against those unseen powers of darkness.